Why bees always have a safe landing. This is a good point for beekeepers, bees don't really need landing boards or anything special at a hive entrance. This is a link to some recent discover at Univ of Michigan. 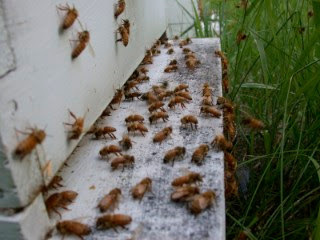 It is about Varroa and how they can possibly develop different compounds to attack it. This link was forwarded to me by another beekeeper. Thanks Rob. I had a weak colony that was too weak to winter. On a closer inspection I noticed that there was some foulbrood on two frames. The colony was weakened from the foulbrood. Foulbrood kills older larvae. This was in the colony for a while and affected the population to the point of it being too weak to survive. There was still honey in the colony so it had not been robbed out. If the colony had been robbed out by other colonies the infection may have been spread to the other colonies. 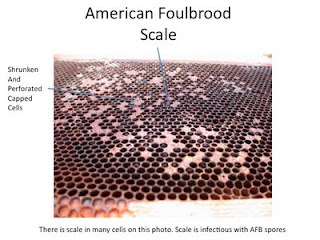 AFB spores survive in the scale. Scale is the dried dead carcass of an infected honeybee larvae. The scale is highly infectious and stays that way for decades. Old used equipment is one way this gets spread around. 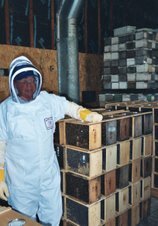 A new beekeeper gets a good deal on some beehives not knowing that there is AFB scale on the combs. Knowing what it looks like can save an expensive lesson. This colony ended up on the receiving end of a lit match.